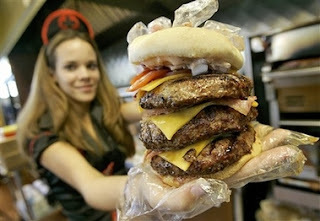 The Heart Attack Grill, a non-kosher deli in Chandler, Arizona, has filed a lawsuit against New York City's 2nd Avenue Deli, claiming that it stole the names of some of its most popular sandwiches, the Single, Double, Triple, and Quadruple Bypass Burgers. According to Reuters, the 2nd Ave Deli asked a federal judge Tuesday to declare that it had not imitated the Arizona sandwiches by offering an "Instant Heart Attack Sandwich" and "Triple Bypass Sandwich" because the New York creations were kosher and used completely different ingredients. An Arizona restaurant's trademark case against the 2nd Ave Deli's "Instant Heart Attack Sandwich" is full of baloney, according to a federal lawsuit filed Tuesday. The Heart Attack Grill, which "proudly serves unhealthy and overly caloric fare such as hamburgers, fries cooked in lard," claims in a letter that the famed New York deli stole its idea for the sandwich and for a planned "Triple Bypass Sandwich." The 2nd Ave Deli, fought back with a lawsuit asking a federal judge to declare that there is no copyright infringement. 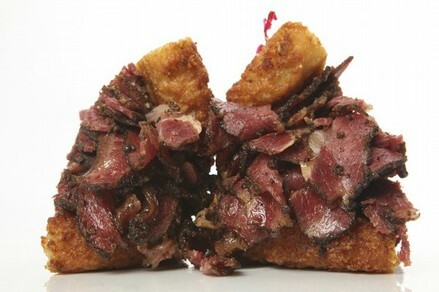 The New York deli says it has been selling its version of the sandwich - of two large potato pancakes (latkes) served with a choice of corned beef, pastrami, turkey, or salami piled high - since 2004, while the Arizona eatery has only been open since 2005. The Phoenix-based grill, which basically sells stacks of cheeseburgers, is decidedly not kosher and unsuitable for the 2nd Ave Deli's customer base, according to the deli's press release titled "Kiss My Tuchas." "There is no way that the "Instant Heart Attack Sandwich" could possibly be confused with the "Triple Bypass Burger," said Jeremy Lebewohl, whose uncle, Abe Lebewhohl, founded the delicatessen. The Heart Attack Grill, which features a single, double, triple and quadruple bypass hamburgers, threatened to sue in a letter sent to the deli, also known as "Uncle Abies," on March 29. "We believe you copied Heart Attack Grill's family of medically themed food items, including its 'BYPASS' trademarks," the letter said in part. "Although copying is the highest form of flattery, in the case of Uncle Abies, copying Heart Attack Grill's trademarks is a violation of Federal Trademark Law." Yesterday's lawsuit filed by the 2nd Ave Deli, now located on 33rd street between Third and Lexington avenues, seeks to have a judge declare no infringement, as well as unspecified court costs.